Shri Badrinath Dham Yatra 2015 Opening Date and Schedule:- Shri Badrinath Dham is one of the most sacred places in India. It is one of the Dham’s from Four Dham’s Of India. The Badrinath Dham is located in the Chamoli District of Uttarakhand state, which is 326 Km from Haridwar. Every year many of Devotees and Peoples are visit the Shri Badrinath Ji Temple to worship of Lord Vishnu. Here you can say that the Meeting of Nar and Narayana. So this year the Badrinath Dham is scheduled to opening on the 26th April 2015. 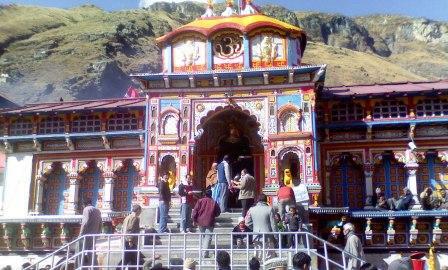 And after that all the peoples, devotees can visit the Badrinath Temple. So here below we are giving you the Trip details of Shri Badrinath Dham. The trip for Shri Badrinath Dham is starts from Rishikesh and Haridwar. So check the given details. Day 4th:- Leave to Haridwar/Rishikesh and en-route you can also visit the Panch Prayags of Uttarakhand, which are Vishnu Prayag, Nand Prayag, Karan Prayag, Rudraprayag and Devprayag. You can prepare the tour for Shri Badrinath Dham as per above given schedule. And you can also contact us for to make a trip for you of the Badrinath Dham and other places in Uttarakhand. For more details you can contact us for the onlineuttarakhand@gmail.com. Stay connected with us for more updates about Uttarakhand News, Uttarakhand Temples and Famous Places, Trip Planning and other Tour Details. You can also follow us on Google+, Facebook and other Social networking site to keep in touch with. You can also follow and subscribe us from our site to get updates with us.